Anyone that loves to cook knows that having the right tools makes all the difference. But, if you’re living in a small space, the kitchen quickly can become cluttered, making it hard to clean and even harder to cook. 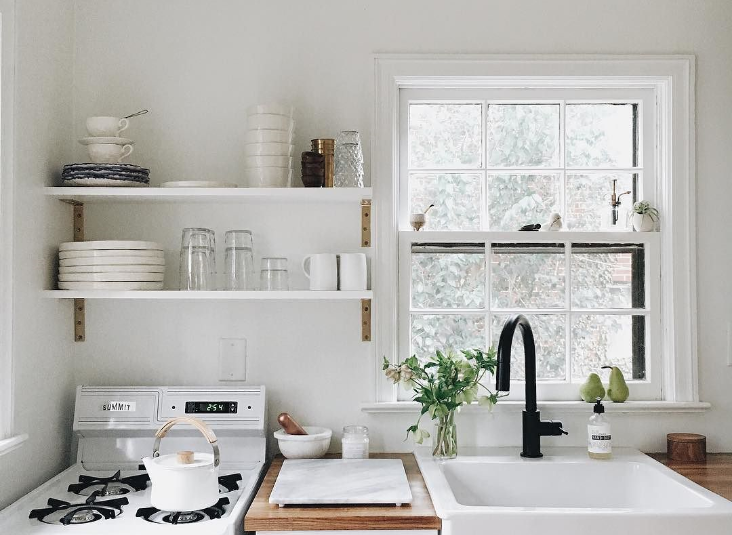 If you need to find a way to store all your kitchen essentials without remodeling, here are some quick and trendy tips that you can do yourself to add some more room in the heart of your home. Very affordable and easy to install in minutes, these hooks will free up so much room! This can be done in or under the cabinet, or even under a shelf. You can either drill holes and use ceiling hooks, or buy specialized slide-in hooks that work by hanging on cabinet shelves. For all the things you don’t use daily, like holiday decor or specialized baking gadgets, the space above your cabinets is perfect! To keep it looking neat, get some wire or wicker baskets that look good together. Then, with a folding step stool tucked into the side of your fridge space, you can access these less often used items when you need them. This space in the kitchen is often either overlooked or poorly utilized. Hang a couple shelves for storing cookbooks, tea towels, or bulk foods. Or look for shelves that are designed to hold pans, cutting boards, and trays vertically. Most people devote an entire drawer to their knives, but in a small kitchen that kind of real estate is valuable! These can be installed on the side of a cabinet or a small space of wall. Not only will it free up a drawer, but what home cook doesn’t want to display their tools as art? For cabinets shelves that are tall, it can be difficult to store things like plates, bowls, and cups by stacking. With wire shelf risers, you can basically turn one shelf into two! These are so affordable and take no time at all to instantly give you more room and less hassle. The inside of your cabinet or pantry doors is the perfect place to hang hooks or hangers to hold things such as pot lids, towels, baby bottles, measuring cups, or tupperware. Completely tucked away and out of sight, but still readily available, this will guarantee you never struggle to stuff those awkwardly shaped items into drawers again.